You will be met in the Arrivals Hall by a representative of Safari Air for your 30 minute flight across the Okavango Delta to Xugana Island Lodge. Xugana means kneel down to drink in the local dialect. Xugana Lagoon has, for thousands of years, been a safe haven for the Bushman people who lived in this pristine water world. Xugana Lagoon is in the permanent Delta, a world of crystal clear waterways winding through vast reed and papyrus beds, opening unexpectedly onto tranquil lagoons, home to bream, catfish and the fighting tiger-fish and fringed by secret wooded islands, haven for the magnificent bird and wildlife that inhabit the Delta. The lagoon is widely accepted as being the most spectacular permanent water site in the entire Okavango Delta. 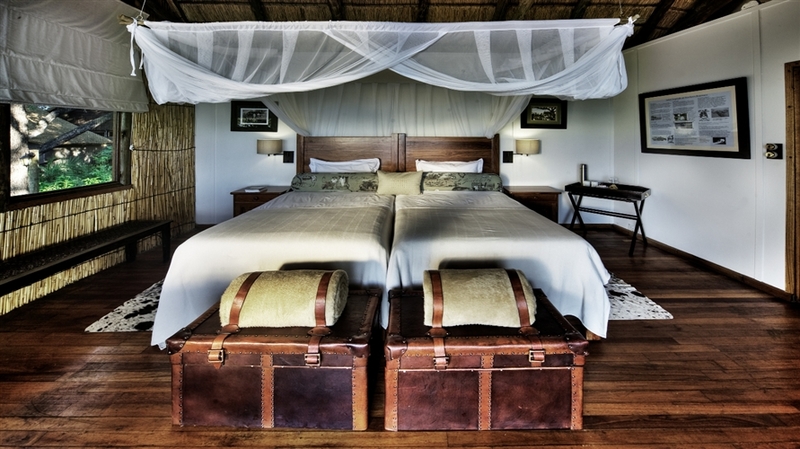 Xugana Island Lodge, situated on a wooded island abutting the lagoon, takes full advantage of this magnificent site. The thatched common area, comprising cocktail bar, lounge and curio shop, is still the original building put up in 1974, when Xugana became only the second tourist lodge ever built in the Okavango Delta. 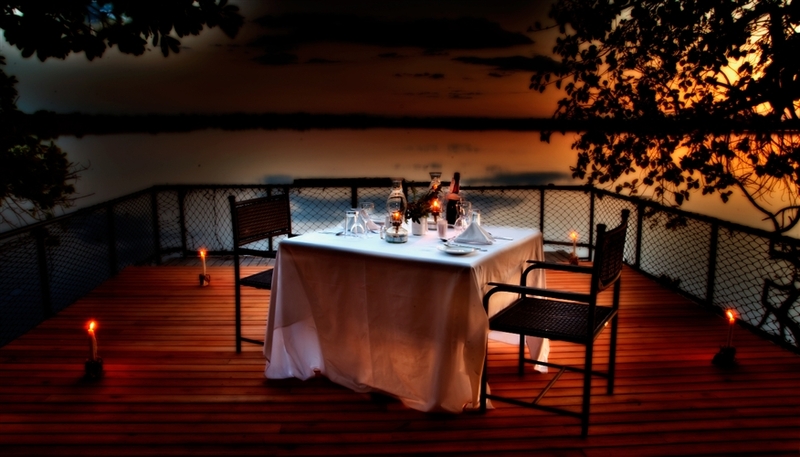 Meals, for which the lodge is justly famous, are taken alfresco on the edge of the lagoon, except on those rare occasions of rain when the lounge doubles as the dining-room. Tea is often served in the garden inside the island, where quiet, secluded reading benches can also be found. The lodge swimming pool is a unique construction, allowing guests to swim in the clear fresh water of the lagoon protected by a heavy metal cage, designed to deter fat Albert the crocodile, a long-time lagoon resident. The lodge accommodates a maximum of 16 guests in raised reed and thatch chalets situated on the shaded fringe of the island, each with a lagoon view through the artfully cleared lagoon-side vegetation. The tastefully decorated chalets have twin or double beds, en-suite facilities, walk-in showers, ceiling fan and a private deck, ideal for bird watching. 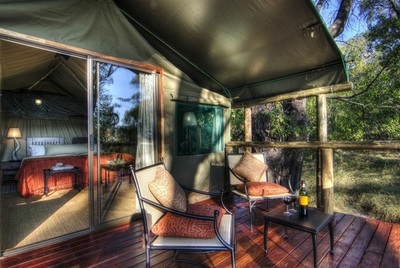 Accommodation includes all meals, local brand drinks, game viewing activities, park entrance fees and laundry service. Mokoro trips in eco-friendly dugout canoes built to the traditional design, boat safaris to lagoons and islands and wilderness walks each give guests the chance to see the Delta denizens such as the Sitatunga and Red Lechwe antelopes, Crocodile and Hippo, as well as the other big game that frequents the islands and riverine fringes. Bird-watching opportunities are outstanding, and the Bream (Tilapia) and Tiger Fishing can be excellent at certain times of the year. The peaceful boat ride back across Xugana Lagoon during the spectacular African sunset provides a lifelong memory. All activities are conducted by experienced naturalist guides, who, as well as ensuring that guests come to no harm, are keen to impart their vast knowledge and love of this unique area. 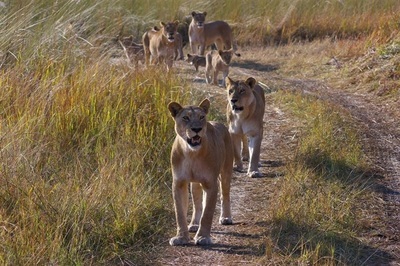 Xugana borders the Moremi Wildlife Reserve and, as such, includes a diverse habitat that supports a wide variety of animals, with possible sightings of Wild Dog, Cheetah and Leopard being highlights. Resident species include Lion, Elephant, Buffalo, Hippo, Giraffe, Hyena, Zebra, Kudu, Red Lechwe, Sable and Roan Antelope and many more. Bird watching is excellent throughout the year. Guided nature walks to the Delta's islands afford an opportunity to track the larger species that inhabit this wilderness area. After an early morning light snack, an activity and brunch, your pilot will collect you from Xugana airstrip, and charter you to Camp Moremi some 20 minutes away. Camp Moremi is situated on the beautiful Xakanaxa Lagoon in the heart of the Okavango Delta, within the Moremi Game Reserve. 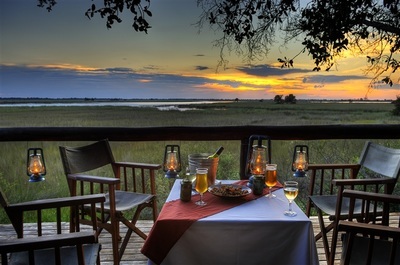 This region is renowned as one of the best game viewing areas in Botswana. Shaded by giant ebony trees, the magnificent Moremi tree lodge is an elegant elevated thatch and timber structure consisting of a main lounge, wildlife reference library, dining room and stylishly decorated cocktail bar. 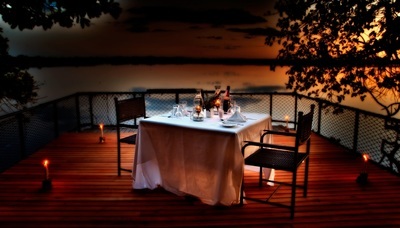 The large sun deck affords an unsurpassed view of Xakanaxa Lagoon. A raised deck swimming pool, covered boma and elevated observation platform assures Camp Moremi of its status as one the finest Botswana lodges. Camp Moremi accommodates 22 guests in East African-style safari tents, individually situated on raised teak platforms. Each tent is well-furnished with an African teak wardrobe, luggage rack, dressing table, bedside pedestals and traditional director's chairs. Woven rugs, designer linen and matching interior blinds complete the picture. Daily camp activities follow a rhythmic pattern in harmony with that of the nature that surrounds the lodge generally you will enjoy a light breakfast of coffee, tea, fruit juices, cereals, muffins and fresh fruit, just before dawn and then set off on extensive safari drives or boating outings. Upon your return to camp three or 4 hours later it's time for a full breakfast followed by lunch or alternatively, especially in the winter months, these are combined into a scrumptious brunch. A siesta is followed by high tea before you will set off again on a safari activity that returns to camp about half an hour after sunset. A chance to freshen up is followed by pre-dinner cocktails and snacks, dinner and coffee and liqueurs on the fire-deck. It is one of the few Botswana lodges that can offer all year round boating trips, as well as extensive 4x4 drives into outstanding game country. The Moremi Reserve is rated as one of Africas finest game-viewing areas, offering sanctuary to abundant herds. 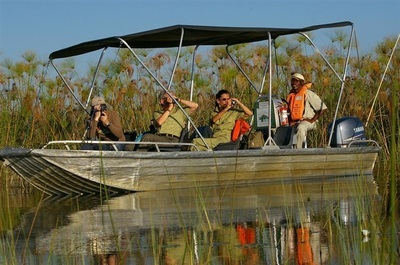 After an early morning light breakfast, an excursion and brunch, you will be chartered from Camp Moremi's airstrip to Maun Airport (25 minutes), in time for your onward arrangements.